Landscaped public gardens will surround a new glass residential tower by Swiss firm Herzog & de Meuron, providing a new space for Stockholm's residents to relax and enjoy nature. Called Gasklockan, the residential development is overseen by Oscar Properties and is being constructed on the site of the former gasworks in the north east of the Swedish capital. The original brick gasholders dating to the late 19th century were designed by Swedish architect Ferdinand Boberg, with cylindrical metal structures added in 1912 and 1932. The 1930s gasholder frame has been taken down to make way for a cylindrical glass tower by Herzog & de Meuron. The tower and neighbouring structures will be surrounded by a wildflower meadow and public parkland by Dutch landscape designers Piet Oudolf and LOLA Landscape Architects. When it is completed, the 90-metre-high tower will contain 312 apartments spread over 28 floors, with a roof terrace planned for the top. The faceted facade is designed to echo the original ironwork structure. The modulated plan means every apartment will sit on a 'V' formation, with bedrooms on one side and living areas on the other, providing panoramic views out over the city, the park and the archipelago coastline. The layout will also afford the individual apartments privacy, something likely to be high on Herzog & de Meuron's list of priorities after their design for the aptly-named Public hotel in New York drew complaints from neighbours who were subjected to full-frontal views of guests' X-rated activities. The Basel-based architects are also behind the Switch House extension to London's Tate Modern museum, which has had privacy issues of its own. The inclusion of a viewing platform caused a palaver when residents of the Rogers Stirk Harbour-designed Neo Bankside housing development next door accused visitors to museum of spying on them and threatened legal action against the Tate. Located as it is within the Ekoparken, an unbroken area of royal parkland that is also the world's first National Urban Park, Gasklockan is unlikely to face the same issues. The landscaped area will provide a green space for residents and local people to enjoy. Snaking pathways will connect two plazas, and an 88-metre-long seating area will curve around the edge of a new meadow garden planted with wildflowers. Dutch garden designer Piet Oudolf, who specialises in planting perennials, is perhaps best known for his work on the High Line in New York, where a disused railway track was transformed into an elevated park. Oudolf designed the gardens in collaboration with LOLA Architects, the Rotterdam-based firm that designed the grounds of the Adidas World of Sports campus in Germany. Recent projects from Swiss architecture firm Herzog & de Meuron include a research campus on a mountain ridge above LA that takes its cues from monastic architecture, and a staggered tower with planted terraces overlooking a marina in Beirut. 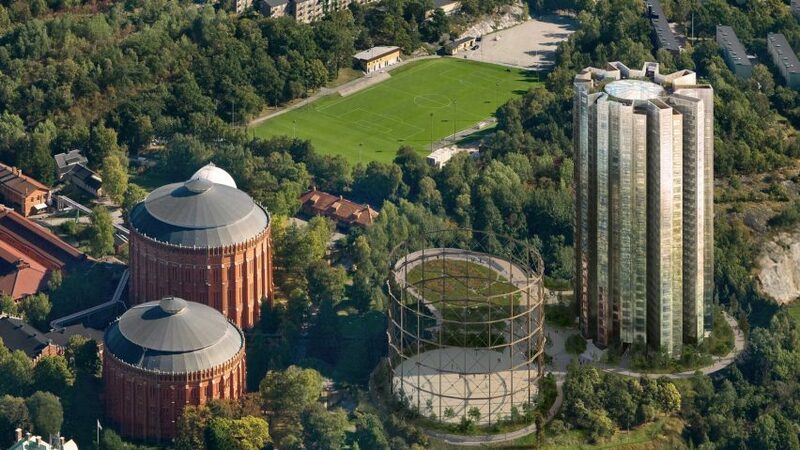 The King's Cross area in London is about to get it's own converted gasholder project later this year. Wilkinson Eyre Architects have painstakingly deconstructed the Grade II listed cast-iron frames and had them specially restored in Yorkshire, before re-instating them around a new development of apartments and penthouses. As part of that area's redevelopment Bell Philips designed Gasholder Park, a public park with a circular lawn that sits inside an old gasholder. Main image courtesy of Herzog & de Meuron.